This Impact Report features pictures of recent outreach events. We’ve been testing a new smaller type of sign as well as content from our new dialogue brochure. To complement the pictures, I’ve asked each of our trainers to select the names of a couple of people you have helped us reach in the past few months. Let’s give thanks to God for each of these and many more we’ve had the opportunity to serve. We are privileged to stand with you each month training Christians to create conversations that make a difference in how people think and feel about abortion. Our aim is always to stay faithful in the field, trusting God to bring change through our efforts, in spite of our weaknesses. Please consider continuing to stand with us through prayers and a generous year-end gift. Rebecca Hotovy (sitting) interacts with a student at KU. Volunteer Pauline listens. Pauline volunteered again at OU. 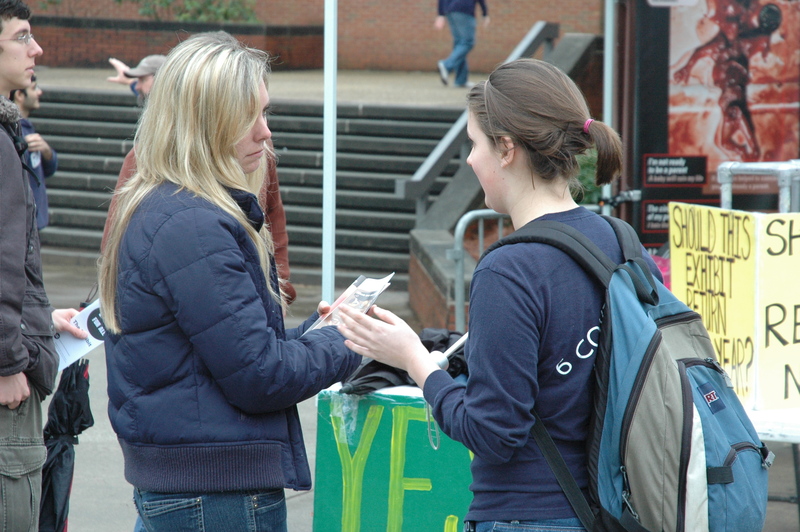 Here Tammy Cook and Pauline interact with a student near the Free Speech Board. Steve Wagner (center) interacts at GMU. At OU, we filled a large expanse of lawn with conversations sparked by content from our Art of Life Exhibit, our Stop and Think Exhibit, and our new Invitation to Dialogue Brochure. Grace Fontenot (red sweater) interacts with students at UNT. Note the new poll question JFA trainers have been testing. Kaitlyn Donihue (pink) creates conversation at OU. Note how the juxtaposed imagery of mother and child makes it clearer that we care about both. Jon Wagner debriefs with Christian Heritage Academy students after outreach at OU. Paul Kulas interacts with a student at UMN. New signs enhance JFA’s poll table outreach. 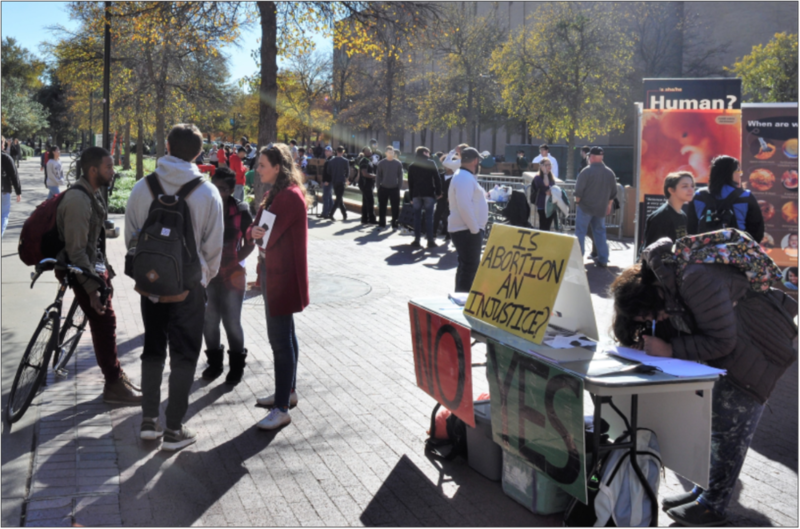 Jeremy Gorr (right) interacts with students near our poll table at Kennesaw State University (KSU). At JFA, we prize one-to-one conversations and the opportunity to help pro-life advocates develop skills for one-to-one conversations. What isn’t always obvious when you look at stories of those conversations is a different sort of story—what it took to bring those conversations into being. Every semester, I look with pride at the list of high-quality events we’ve just completed across many states, awed by what JFA’s staff, volunteers, and supporters were together able to accomplish with God’s help. Spring 2016 was a good example, as you’ll see in this Impact Report highlighting our work across nine states, including 12 seminars, various presentations, and 16 days of outreach on nine campuses. Our passions for more conversations and more advocates animated and emanated from every one of these events. Thank you for your generous gifts to JFA to help us continue to work to make abortion unthinkable. We’re honored to serve alongside you. February: Jon Wagner (center) teaches during a seminar preceding outreach at University of Georgia. March: During outreach at Oklahoma State University (OSU), JFA Volunteer Carson Banks (who also helped invite JFA to campus through his work with the OSU student organization Cowboys for Life) interacts with other OSU students. Highlight: JFA/RLCC Mentor Marcos Espinoza led his interactive small group at the seminar in Fresno entirely in Spanish—a first for JFA. Pastor Chris (above, left), who also attended the outreach event commented that the workshop was "so helpful and practical as an introduction for preparing believers to begin a loving conversation with those who are for abortion." Highlight: JFA equipped four Methodist ministers during these two seminars in Pittsburgh, Pennsylvania. This is especially exciting as recent pro-life efforts in the Methodist General Conference are this year causing productive discussion about the Biblical call to protect unborn children and will likely continue to cause discussion in future years. Note: In addition to planning events and giving leadership to JFA, Paul Kulas and I led the JFA team in the design, construction, and structural testing that enabled us to display each of our new large-format exhibits for multiple days in April and May. Jeremy Wheeler and Jon Wagner worked many hours in the warehouse with Paul building signs. All of our training staff contributed ideas, gave feedback, and shouldered various day-to-day tasks for Paul so that the exhibits could be completed. You can learn more about funding the new exhibits at www.jfaweb.org/invest. Look for pictures of the new exhibits in a future letter, at www.facebook.com/trainthousands, or at www.jfaweb.org/blog. April: Catherine Wurts interacts with a student during outreach at Colorado State University using JFA's new "Stop and Think" Exhibit. In addition to the events listed above, JFA trainers were present at Washington and San Francisco pro-life events in January (Evangelicals for Life Conference, March for Life, Walk for Life West Coast, West Coast National SFLA Conference) and throughout the semester, JFA trainers gave presentations in Sheboygan, Wisconsin (Jeremy Gorr), Valley Center, Kansas (Joanna Wagner), Wichita, Kansas (Tammy Cook), and Prescott, Washington (CK Wisner). Steve Wagner led an interactive seminar in Washington, D.C., and Rebecca Haschke led an interactive workshop in Norfolk, Nebraska. Thank you for partnering with JFA as we create events that make it possible for more advocates to have more conversations. Your gifts are especially helpful during these summer months, as our team focuses on planning a full slate of events for the fall!